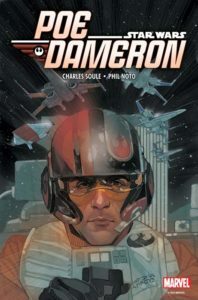 In celebration of The Last Jedi being so awesome, I decided to review a title from Marvel’s Star Wars collection: Poe Dameron. It only makes sense that Marvel would create a comic based on one of the coolest characters to come out of the new films. Poe Dameron is the quintessential hero: he’s rebellious, funny, tough, and brave. The story by Charles Soule and art by Phil Noto stays true to the slick white-guttered backgrounds that we’ve become accustomed to in our Marvel hero books, and I mean that in as a compliment. I love clean, amazing art with smatterings of bleed and splash pages. 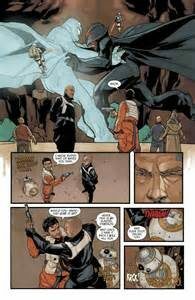 Like the films themselves, the Star Wars comics look great! The story here (over the four issues that this review covers) is a simple one with lots of twists and turns. Poe must assemble a small team of fighters and complete a mission directly given to him by Leia Organa: find a man named Lor San Tekka; he might have a clue as to Luke Skywalker’s whereabouts. The team runs into a few bouts of trouble, we explore a cool new First Order bad guy, and we get more Star Wars fun! Keep the Force alive this Christmas break with Poe Dameron and many other Star Wars comics from Marvel. They’re not paying me for this…I just dig them. The Chewbacca book is super fun too. And so is the Darth Vader.